“To destroy a biblical tel for a road is unprecedented,” said Govrin with the excavation’s trellis-like grid of ancient stone walls as his backdrop. 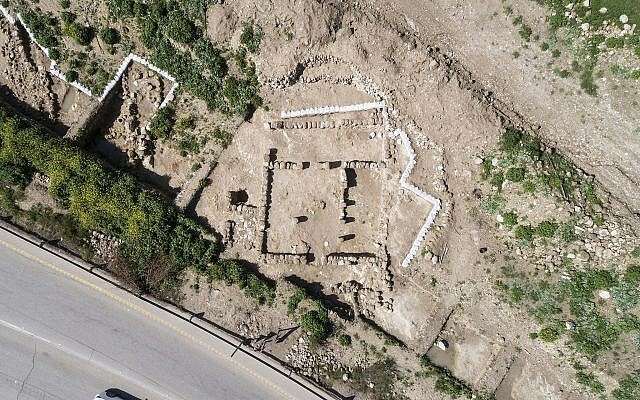 But even a recent compromise plan between the Israel Antiquities Authority and Netivei Israel — The National Transport Infrastructure Company Ltd. — appears to be unable to save the ancient site from at least partial destruction. Since February 2018, Govrin’s early “tremors” of excitement at finding evidence that contradicts the idea of an uninhabited wasteland during the 7th century BCE have translated into an earthquake of controversy. 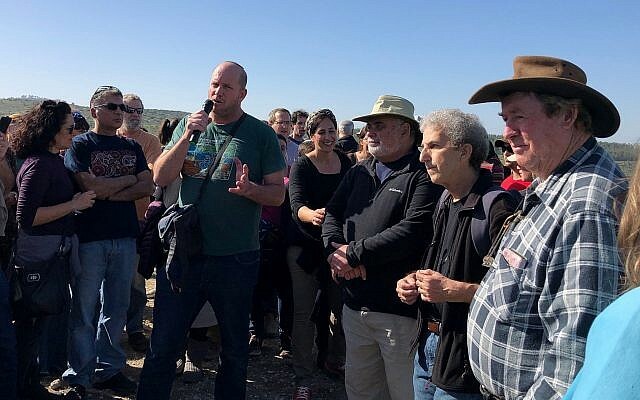 Residents of Beit Shemesh — those who stand to benefit most from the road — as well as thousands of Israeli researchers and laymen have called for a halt to the construction to save the biblical settlement. Activists calling themselves the “Knights of the Tel” post regular Facebook updates and circulate an online petition pushing for the construction of a tunnel. Regular Friday morning awareness-raising protests can bring up to a thousand supporters. 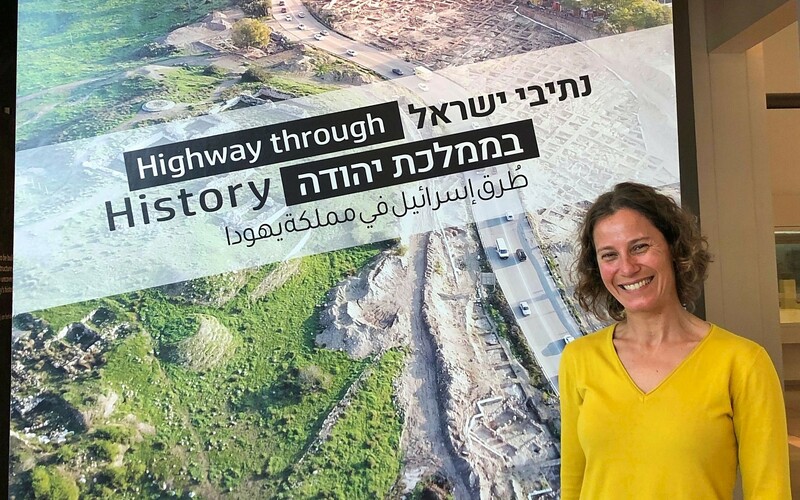 Capturing the quandary, on Tuesday the Bible Lands Museum Jerusalem opened a bold exhibit called “Highway through History.” It illustrates the acute relevance of archaeology as the imperative to preserve the ancient past collides with tangible modern need. “A great deal of media attention has been focused on these excavations, rightfully so, and it is our privilege to invite the world to come and see this evidence firsthand and to understand why,” said museum director Amanda Weiss ahead of the opening. On display are a selection of Govrin’s finds. 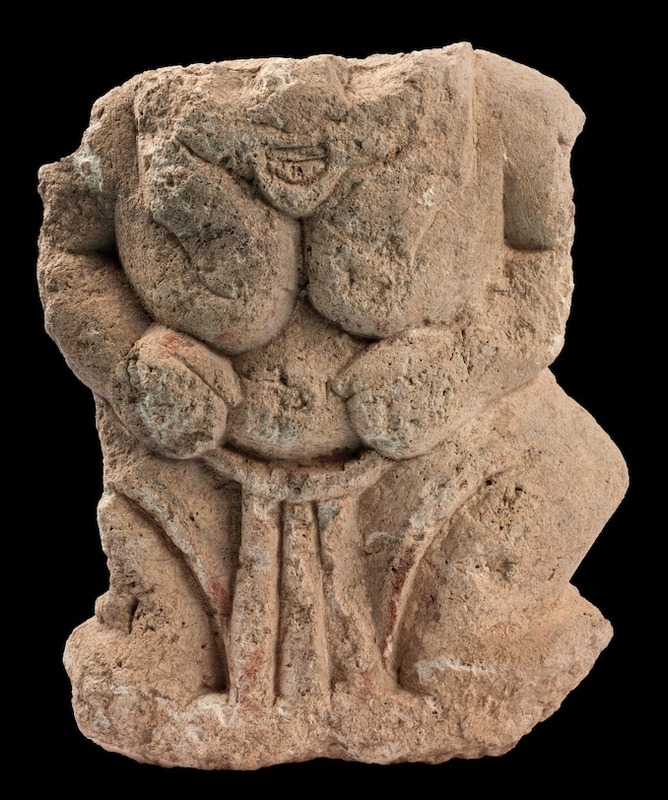 The crown jewel is a large, headless stone Bes (a lucky Egyptian god in the shape of a fat dwarf), which is the first of its kind to be discovered in the Land of Israel. 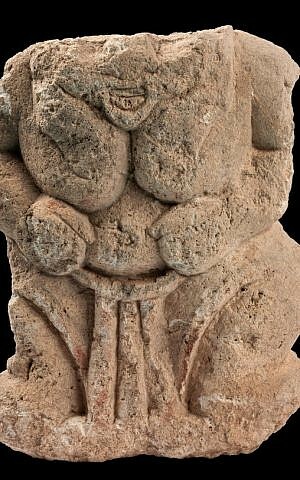 Other artifacts include shattered cultic statues (harkening to religious reforms of Hezekiah and Josiah described in the Book of Kings against idol worship, perhaps? ), a roller to crush olives and more evidence of oil industry. Alongside the unusually still dirty, unpublished artifacts from the recent dig are displayed proposed road plans — past, present, and likely future. There has been a roadway in this area — where several ancient routes and borders meet — for some 3,000 years. Excavations have revealed human settlement on the archaeological mound since the late Bronze Age. This pre-biblical history is preserved in the town’s name, which is taken from the Canaanite sun goddess, Shemesh. Many of the great characters of the Hebrew Bible also passed through Beit Shemesh, literally the House of the Sun — until the Assyrian King Sennacherib stormed the land in 701 BCE, as recorded in the book of 2 Kings. 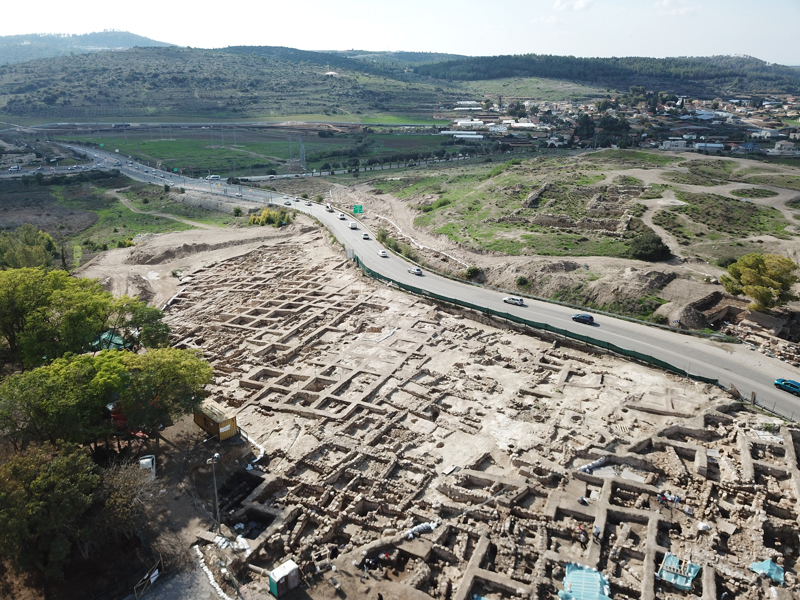 After almost three decades of excavations at the top of what was considered the “official” archaeological mound, common thinking believed that Tel Beit Shemesh was abandoned following Sennacherib’s campaign. 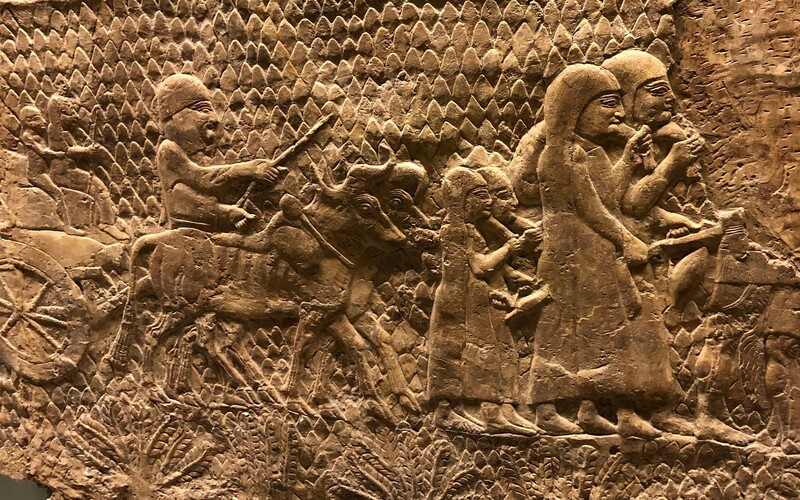 The successful suppression of King Hezekiah’s rebellion is recorded both in the Bible and in contemporary sources, including on an intricate relief now found in the British Museum, which depicts the razing of nearby Lachish. 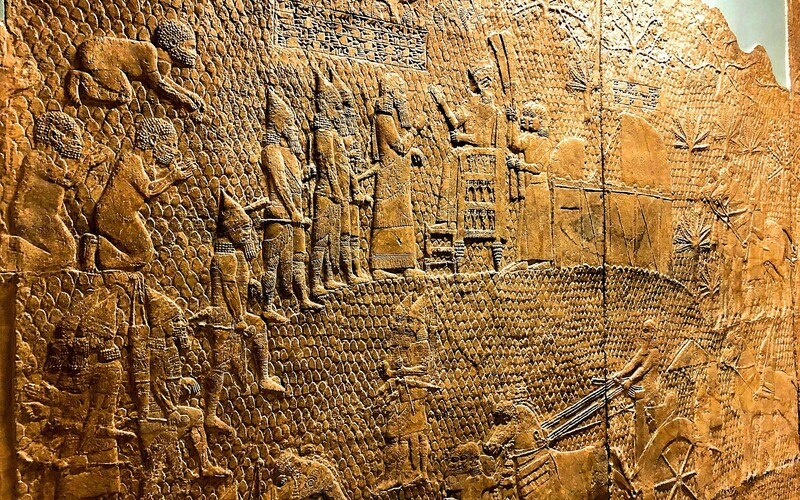 Likewise, in Sennacherib’s annals, dating from 690 BCE, it is written that the king and his army conquered 46 walled cities (but notably not Jerusalem) and countless smaller settlements. Some 200,150 people and livestock were taken as chattel and much of Judah was thought to lay barren. After conquering and destroying the settlements of Judah, the Assyrian king and his troops put the rebellious King Hezekiah in his proper place: he became a subordinate, heavily taxed vassal. 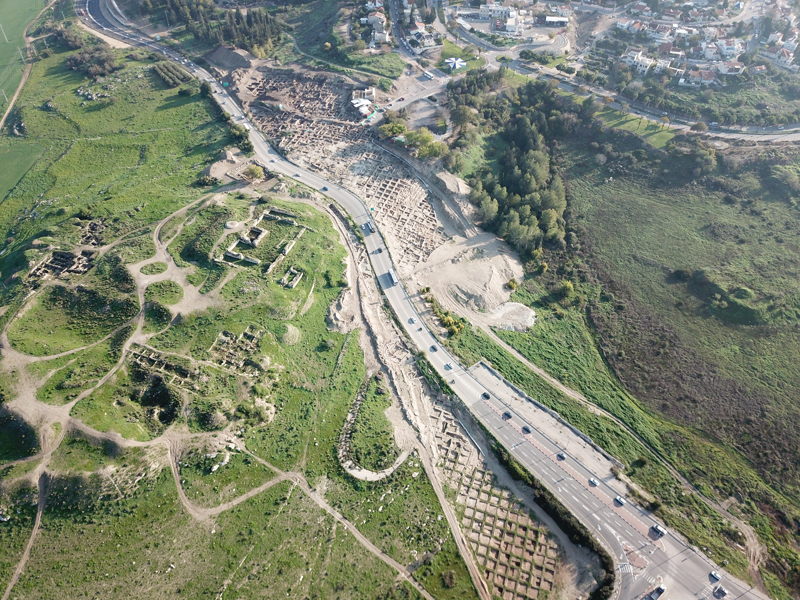 When Beit Shemesh was built in the 1950s, tractors razed part of the hill to create access to the road that today bisects the archaeological site. These tractors, said Govrin, unknowingly cleared the later phases of settlement, including the Roman and Byzantine periods. As the fledgling town was developed, some nine meters of dirt and other building debris were dumped on its outskirts directly on that shaved hill. This huge pile of debris is credited with unintentionally preserving the 7th century BCE settlement and its olive industry. 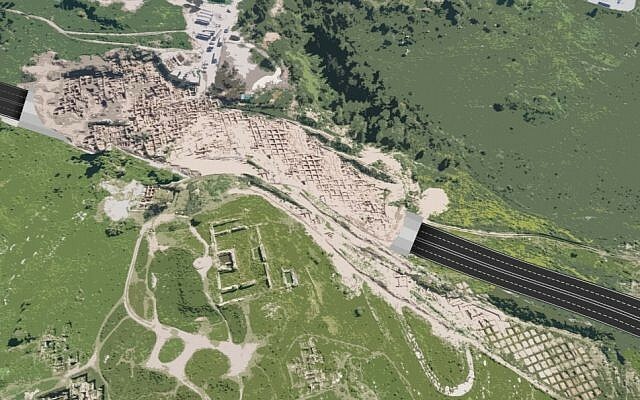 While excavating at the foot of the archaeological hill that was marked for highway construction, Govrin said he was forced to remain within a carefully circumscribed strip next to the current roadway. 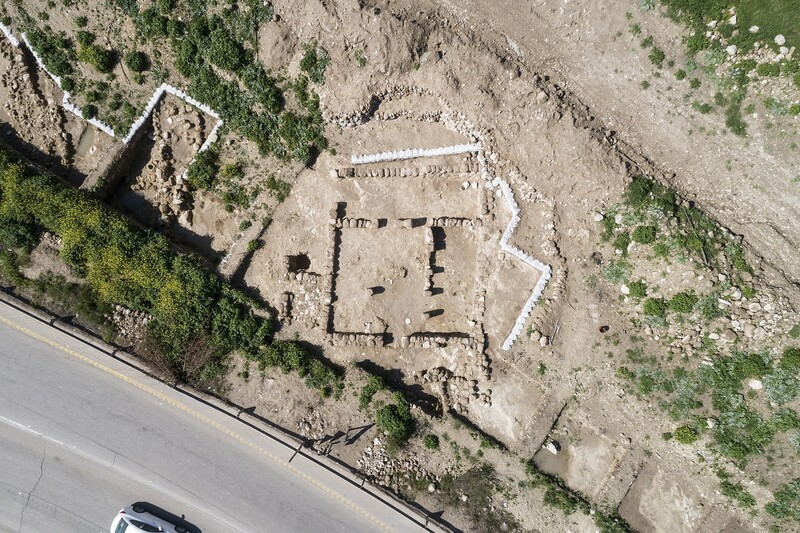 As a salvage excavation, his dig was approved by the Israel Antiquities Authority and funded by Netivei Israel, the government company tasked with planning, development, and maintenance of Israel’s roads. Basically, since the road had already been approved by the IAA, it was Govrin’s task to check all the legally mandated boxes, see what artifacts could be retrieved, and then release the land ahead of road construction. And then the eureka moment happened. 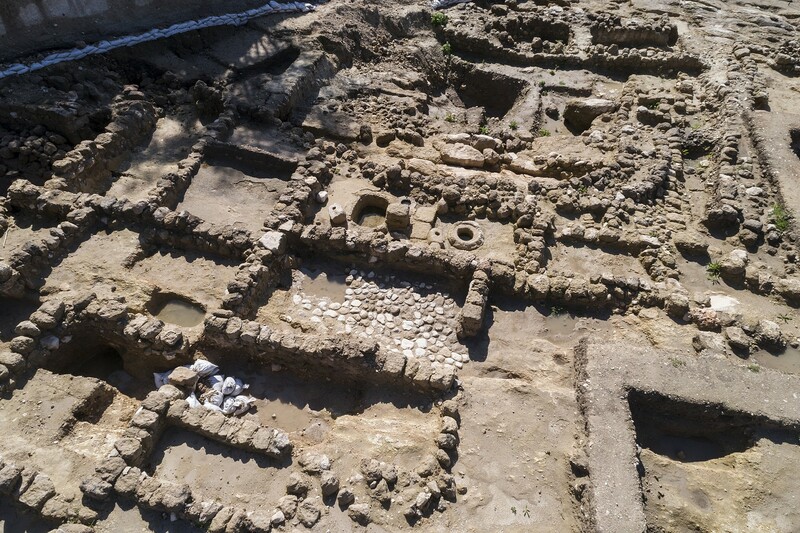 The discovery of the biblical-era Kingdom of Judah settlement “came as a total surprise,” IAA’s Jerusalem district head Yuval Baruch told The Times of Israel in a lengthy phone conversation. Due to the depth of the modern debris pile, a series of initial tests completed by the IAA and Tel Aviv University hadn’t come up with anything of note. Despite the logistical difficulty in excavating the irregular sized area on both sides of the road, Govrin managed to uncover some 15 olive presses and over 200 “royal” jug handles labeled “for the king.” In addition to thought-provoking artifacts, the excavation offered impressive structures, including what Govrin considers a large administrative center. For Govrin, it was evidence of a large-scale olive oil industry in an area — and especially era — that was meant to be vacant. 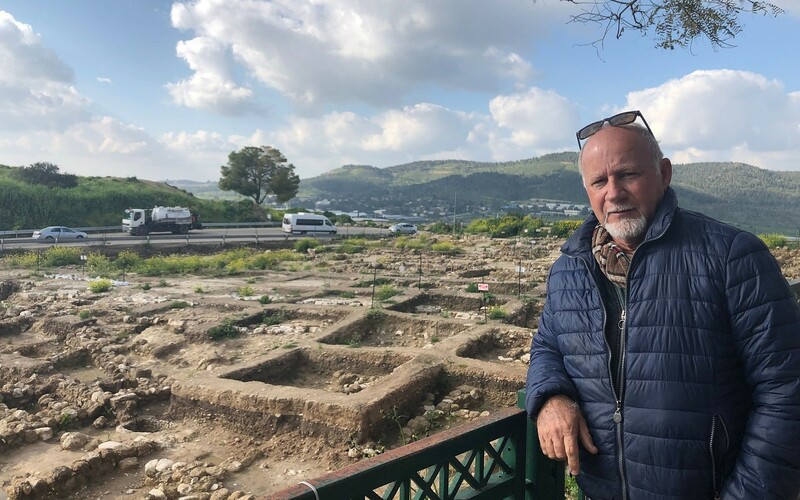 Until recently, said Govrin, a research fellow at the Hebrew Union College, archaeologists tended to only look at strategically high points for settlement, not the harder-to-defend lowlands. He hypothesized that following the Assyrians’ campaign, fortification was perhaps no longer necessary (or allowed). 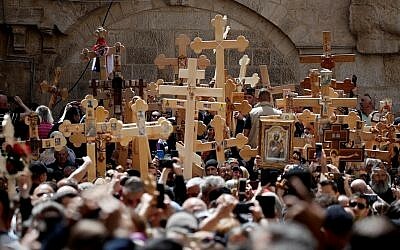 The Judeans could therefore settle in a more hospitable area, closer to the plaster-covered water cisterns his large team of 150 workers and 10 archaeologists had unearthed. 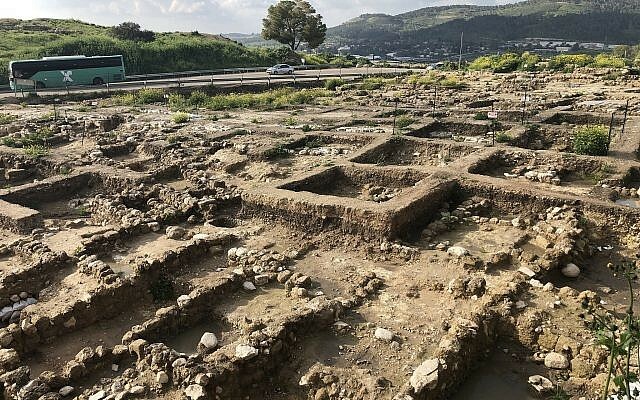 In discovering the unexpected industrial zone and dozens of houses on the relatively small strip of land, “we solved the central mystery of why it was that we didn’t have evidence of the 7th century” BCE — because archaeologists had searched in the wrong places. “Not only did they settle, but there was a massive settlement,” said Govrin. 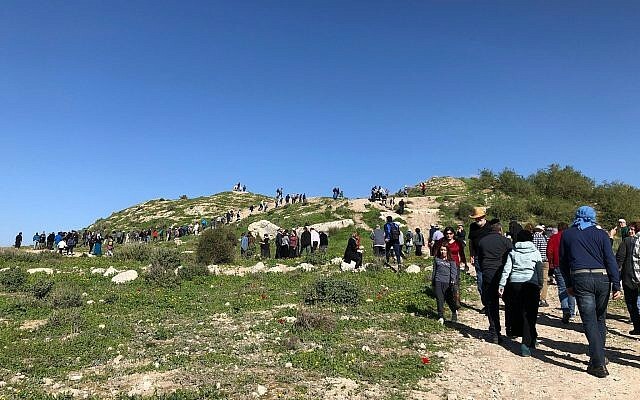 On a sunny Friday morning in early January, the bright red anemones dotting Tel Beit Shemesh were in danger of being outnumbered by people. 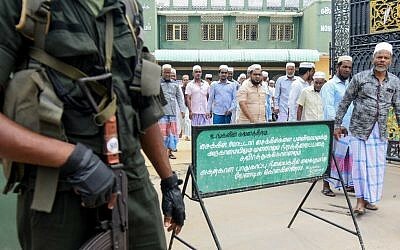 Parking their cars kilometers down the roads, the protesters had come in support of conserving the recent archaeological finds. The crowd stirred as the new mayor of Beit Shemesh, Aliza Bloch, joined a large group led jointly by Yaron Rosenthal, head of the Kfar Etzion school, and two Tel Aviv University archaeologists, Zvi Lederman and Shlomo Bunimovitz, who spent some 30 years excavating the hill. Bloch said that as mayor she is pushing for the site to become a national park and vowed to bring busloads of schoolchildren. 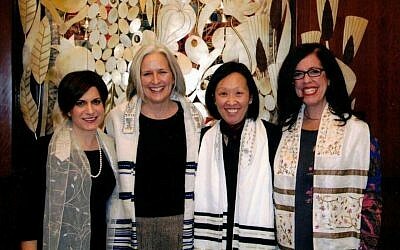 “In general there is a lot of willingness from the ministries to be with us on this,” she said. “Today’s trip is to see our roots and, at the same time, to see the future,” said Bloch, standing in the warm January sun. In a perfect world, the will of the public buzz and the informed opinion of a few archaeologists and politicians would be enough reason to change multi-million shekel infrastructure plans. 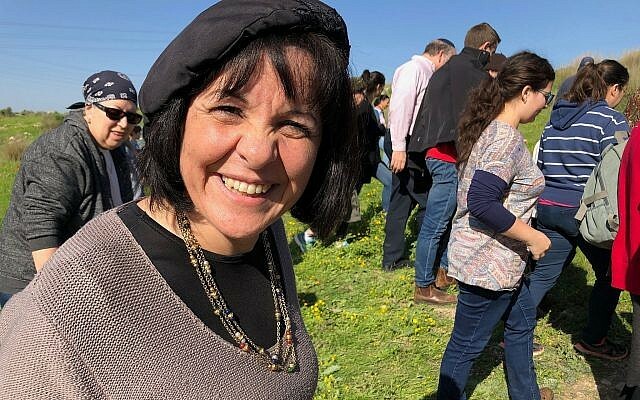 Anti-highway activists are pushing for the construction of a tunnel, which, according to a Netivei Israel spokesperson, would cost 20 times the project’s existing budget. Even if the site itself is “saved,” however, would the archaeology be given proper treatment and conservation? According to Tel Aviv University Prof. Israel Finkelstein, it’s unlikely that any new site would be maintained properly without proper staffing — and a proper budget. 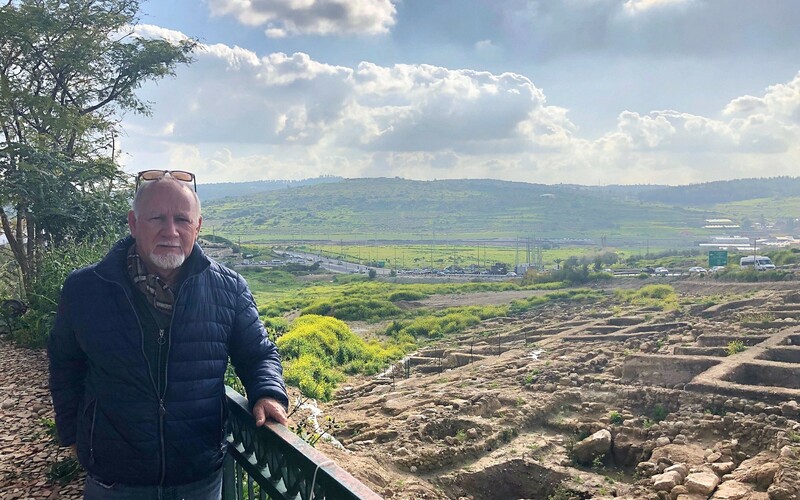 Within two years, he predicted in a brief phone call, Tel Beit Shemesh would be filled with vegetation and plastic bags, just like so many other archaeological sites in Israel. 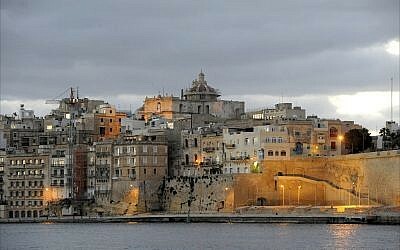 “Preservation, maintenance and presentation to the public of an archaeological site is very costly. 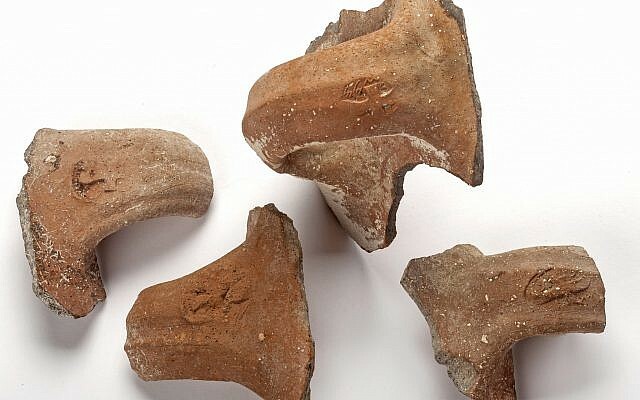 Hence, in a country with so many archaeological remains, priorities must unfortunately be made,” said Finkelstein, one of Israel’s preeminent archaeologists, in a follow-up email. “As far as I can judge, in the case of Beit Shemesh, the most important need is to preserve the tel (to the west of the road). 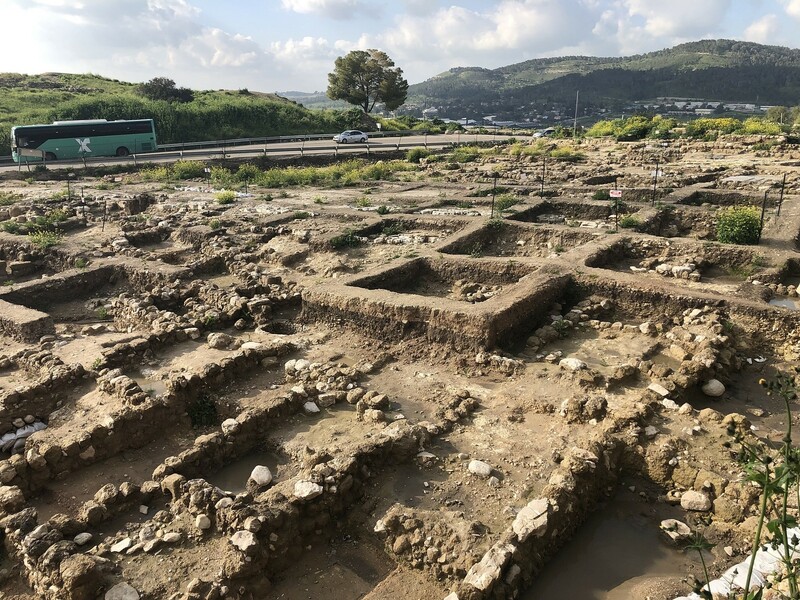 The remains unearthed in the salvage digs to the east of the road are of course important, but to the best of my understanding, not unique,” he said, citing the olive oil industries discovered in neighboring Tel Miqne and Tel Batash — and even on the mound of Beit Shemesh. 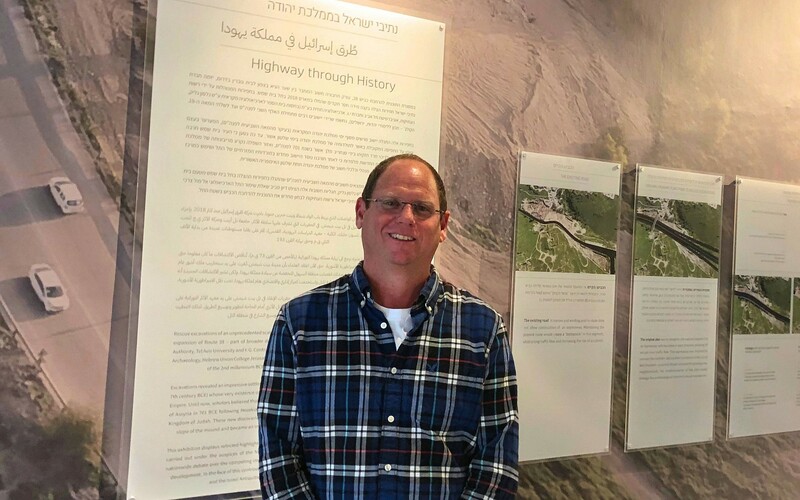 The day before the Highway through History exhibit opened, deputy Bible Lands museum director Leora Berry and curator Yehuda Kaplan were on hand to explain its unusual concept. 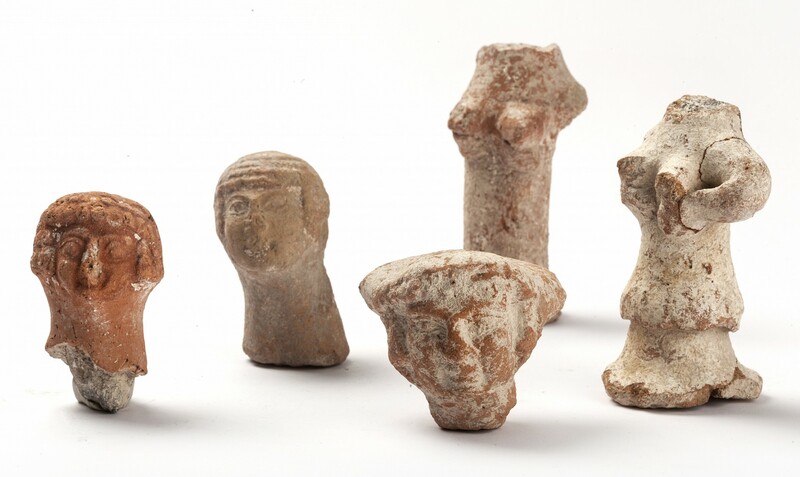 Produced in cooperation with the Israel Antiquities Authority, Govrin’s Y. G. Contract Archaeology, Netivei Israel, and the Hebrew Union College, the exhibit is housed in the museum’s new Focus Gallery, a space intended to showcase the overlap of history with today’s issues. According to Berry, the idea of highlighting this contemporary controversy came only four months ago from a museum guide, whose partner was participating in Govrin’s dig. She said the museum saw the issue as an “opportunity to bring archaeology, and make it relevant,” she said. Berry, who has a background in urban development, emphasized that the museum does not take a stand on the issue. “We are a platform for public debate,” she said. At the same time, “sometimes the public can beat its drums and make change,” said Berry. 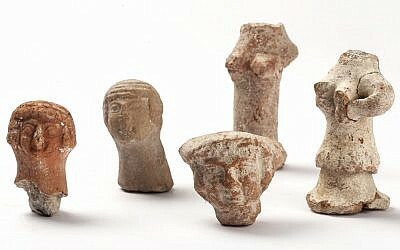 Beit Shemesh is only one of many places in Israel dealing with the ongoing conflict of preserving the past while developing for the future. “Wherever you dig here, you’ll find heritage — and not necessarily Jewish,” Berry said. In the tones of gray the museum tends to favor, the exhibit focuses on three main themes: the olive oil industry, as represented by reconstructed jars and ancient olive pits from the site; distribution and administration, through dozens of jar handles, some sealed with the Egyptian winged sun disc and inscribed in paleo-Hebrew with names similar to those found at Hebron and Ramat Rahel, other known industrial sites; and the evolution of highway plans. Throughout the exhibit tour, curator Kaplan spoke about the 7th century BCE’s historical geopolitical struggle — the failed uprising which led to a new, heavier tax burden alongside a relatively long state of peace. 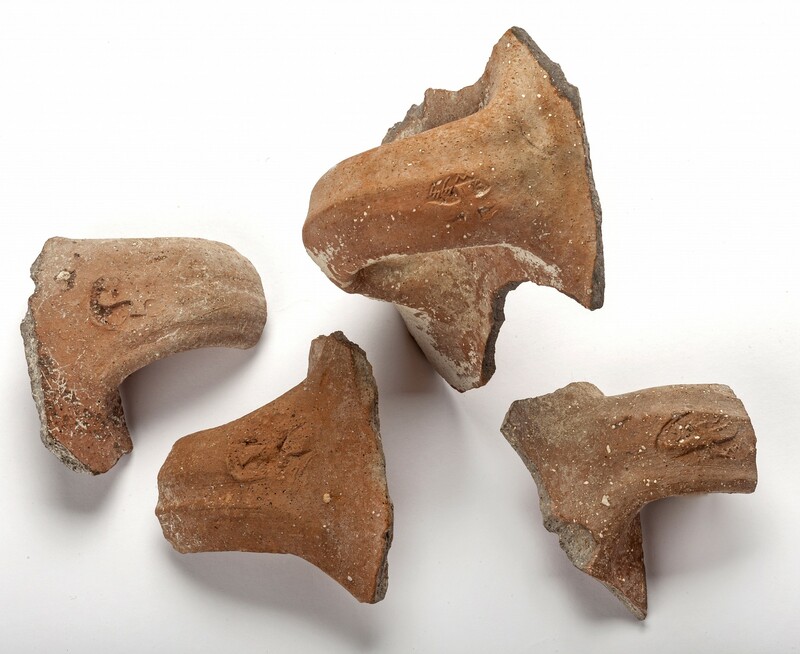 The items in the exhibit raise the question of whether the oil produced at Beit Shemesh may have been one of the luxury items sent to pay the vassal state’s tribute. Text in Hebrew and English explains the push-pull of the need for a modern road versus protecting heritage versus the state’s budget. A wall is devoted to various versions of the plans — included rejected ones — and explains the advantages and disadvantages of each. Looking at this wall, it becomes clear that a tunnel dug under the archaeological site is the best possible option — were money no object. But money is a huge consideration. 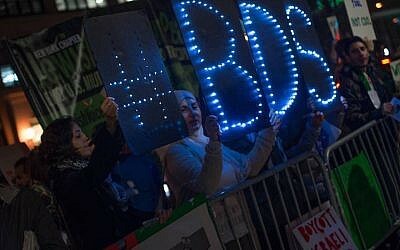 As Ben Gutman, the spokesman for Netivei Israel, put it, after a budget allocation of NIS 70 million for the archaeology alone, who can justify putting more money into artifacts from the past when the modern state is struggling to fund hospitals and the Iron Dome? “It’s not logical,” Gutman said. Finding such a vast sum of money — even through a private philanthropist — would be like “chasing unicorns,” he said. 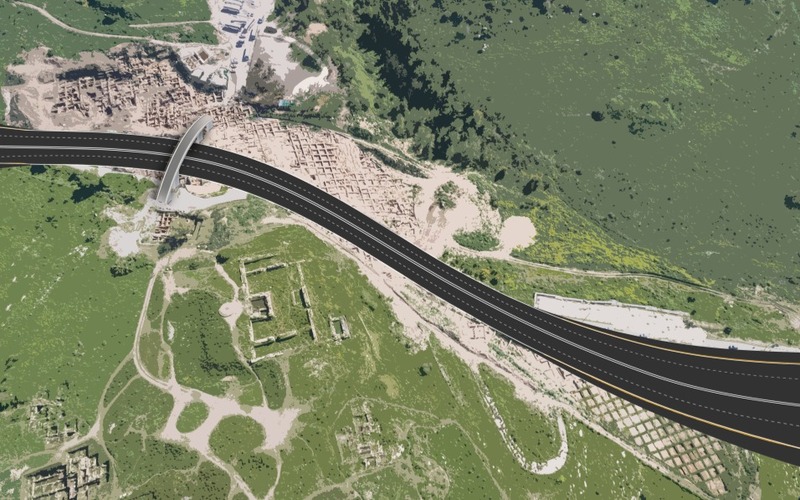 The last panel in the museum displays an artist’s rendering of the almost signed, sealed and delivered compromise: In the section of the highway that bisects the archaeological site, the existing two-lane road will still be enlarged to four, but the shoulders are kept to a bare minimum to dramatically reduce the impact on the archaeological site. Govrin noted that in the compromise agreement, “half” the site will still be destroyed for the widened road.